Well, it’s been another busy ‘Twilight’ day. As you can imagine, being in Forks and staying at ‘The Cullen House’ means we have been meeting lots and lots of other Twilight fans so we’ve spent a good part of the day chatting and sharing stories with like-minded fans. It’s been a wonderful experience. It’s mainly the ladies and girls doing all the chatting of course whilst the poor menfolk stand by suffering in silence!! It was quite a romantic start to the day because before breakfast this morning one of the guests, Cindy (a big Twilight fan) was proposed to by her partner Eric!! I think Cindy has met her real-life Edward!! Cindy told me about a new Twiight-related DVD that she had bought down the road in a shop called ‘Twilight Central’. The DVD is called ‘Twilight in Volterra’. So, having heard nothing about the DVD and needing one for my Twilight collection of course, our first job of the day was to stop by the shop and get a copy. The producers of the DVD are the same people who made the DVD ‘ Twilight in Forks’ and has only been available for about three weeks. 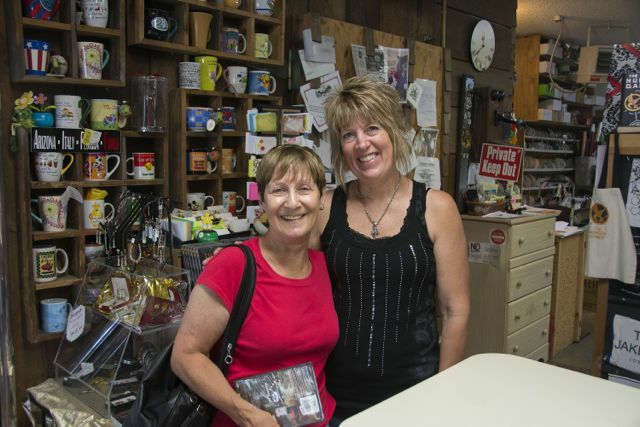 I have the ‘Twilight in Forks’ DVD and to my amazement it turns out that the lady who was interviewed for that DVD and appears on it is only the lady who owns Twilight Central, Charlene Leppell!! Small world or what!! 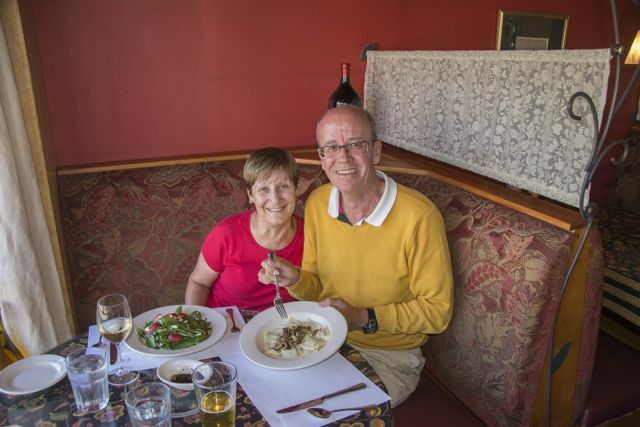 We then moved on to Port Angeles to have a look at Bella Italia, where in Twilight, Edward and Bella have their first date and she eats mushroom ravioli. Stephenie Meyer has actually visited Bella Italia and they have Bella’s mushroom ravioli on the menu too. As I don’t really like mushrooms, Si did the gentlemanly thing and said he would eat it himself just so that we could say we had ordered it. Bless!! The waitress sat us at a round table right in the window. It was a lovely spot and we like to believe that that was the table Edward and Bella sat at in the book. Megan, Ali and Adam – Abi’s hiding somewhere!! Life can be strange sometimes and whilst we were eating dinner the waitress told us that the family two tables down from us were also Twilight fans and that they were on their way to Forks and would be staying at The Cullen House tonight also. It turns out that the family were Megan, Adam, Ali and Abi from Arizona and we had a lovely long chat with them this evening about all things Twilight and some about Harry Potter too. The girls are hoping that Adam will drive them to some of the movie sites down in St. Helens tomorrow!! 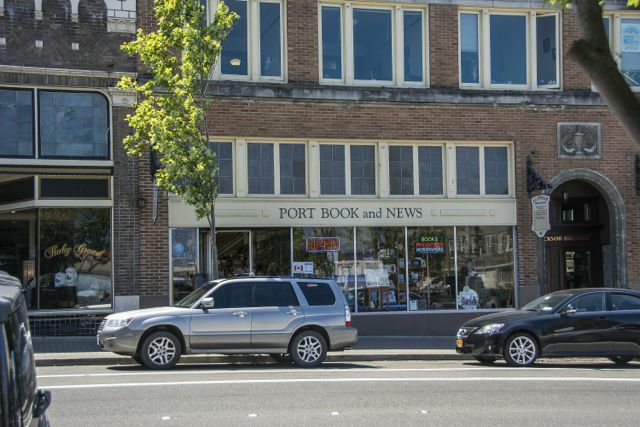 Also in Port Angeles is Port Book and News. This is chosen as the book store where Bella just looks in the window but never enters. This location is chosen on the book tour because it is in the same area as Bella Italia and where the girls would have been shopping for prom dresses. 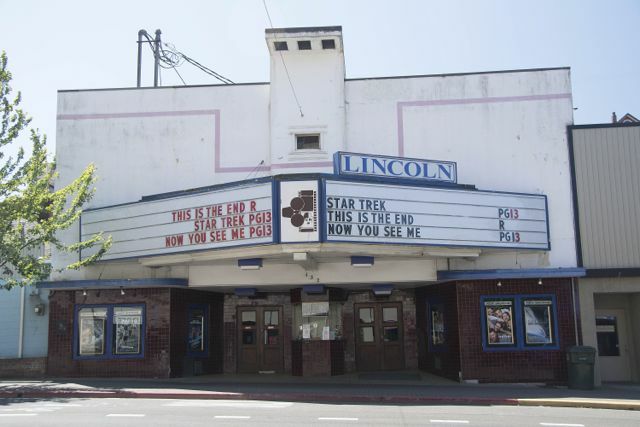 Just up the road is the Lincoln Cinema. There are only two cinemas in Port Angeles and although the name is not mentioned in New Moon (where Bella goes twice to the cinema, once with Jessica and then again with Jacob and Mike), this venue is most popular with Twilighters. 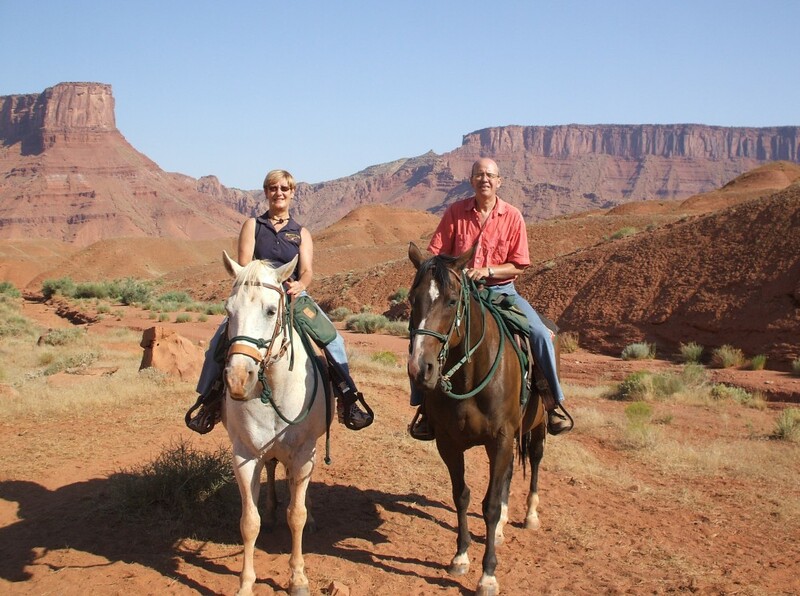 You are meeting so many new folks along the way! 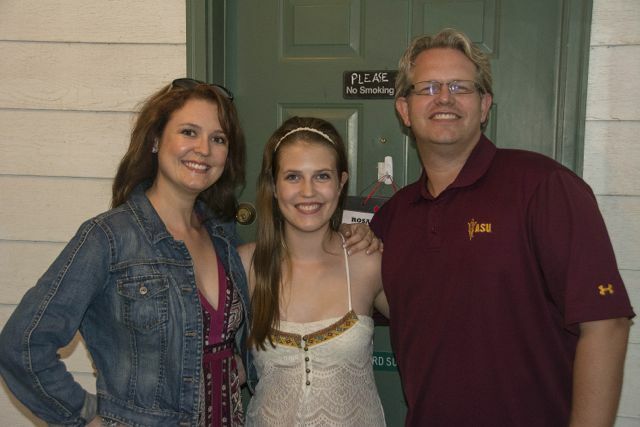 I love that it’s a whole family there too! This is just too exciting! Hi Nat, we have met so many lovely people here in Forks. It’s been great talking about Twilight to people we’ve never met before and hearing their views on things. Go Twilight!! Mmmm the mushroom ravioli looks delicious. I love that you are getting to discuss Twilight all over again with folks who ar such fans of the books and movies!! Hi Dot, Si said it was lovey. Yes it’s been wonderful. Twilight is alive and well in Forks!! Type there then ………. meant ‘lovely’ not lovey’. I’ve been drinking again!! Mmmm the mushroom ravioli looks delicious. I love that you are getting to discuss Twilight all over again with folks who are such fans of the books and movies!! Sandra, I figured out how to correct typos after you hit “post.” Right click in the box and click on go back! It works!!!! It’s easy for me to correct typos Dot because I can just go into the dashboard and correct mine!!!!! !